ADATA introduces the XPG SX910, a new SandForce controller based line of solid state disk available in 128GB, 256GB and 512GB capacities for $189.99, $379.99, and $749.99, respectively. The XPG SX910 promises read speeds of up to 550MB/s, write speeds as high as 530MB/s and maximum 4k random read/write speeds of 50,000 and 85,000 IOPS, respectively. ADATA also claims that this disk offers 7 percent more capacity than common SSDs because new firmware enhancements made it possible to use zero percent over provisioning. 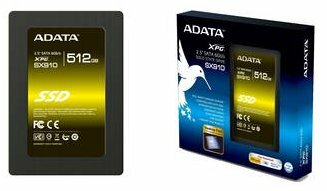 ADATA™ Technology launches the XPG SX910 solid state drive, a significant broadening of the popular and powerful XPG line of storage products. The SX910 features a 7% capacity increase over common SSDs that use a SandForce controller, delivering a powerful combination of capacity and high performance with a five-year warranty. The ADATA XPG SX910 uses new optimized firmware to maximize utilization of the NAND Flash components, allowing for full use of the available storage capacity. This zero percent over-provisioning in the design and engineering of the SX910 is implemented with no loss to performance: maximum 4k random read/write speeds are 50,000 and 85,000 IOPS respectively, with sequential read and write speeds reaching 550 and 530MB/sec. In addition, the SX910 undergoes an improved screening process for the Flash IC chip selection. This results in improved stability and performance, that is demonstrated by the five-year warranty that comes as standard for this SSD. With capacities of 128, 256 & 512 gigabytes, the SX910 is positioned to meet the rigorous standards of the world’s most serious gamers and professionals.